The poster itself is an artistic sketch of Richard Nixon smiling confidently; then, in the background is an assortment of celebrities Clint Eastwood, Wilt Chamberlain, and politicians like Ronald Reagan. His daughter is in it as well carrying a sign, and his running mate Spiro Agnew stands immediately behind. The main slogan of the poster is "Nixon's the One." This theme was also the main slogan of his campaign found on bumper stickers and posters like this one. It was also the basis of one of his TV commercials which made the point that Nixon was the one you wanted in office "in these troubling and dangerous times." 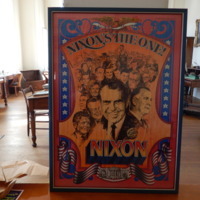 J. Michaelson, “Nixon Campaign Poster for 1968 Presidential Election,” UIS History Harvest, accessed April 19, 2019, http://uishistharv1.uis.edu/items/show/202.